Wing span: 7/8 - 1 7/16 inches (2.2 - 3.6 cm). Identification: Upperside is dark brown with orange markings; orange along the costal edge of forewing enters the end of the cell. Male has a sinuous forewing stigma. Underside of hindwing is brassy with no markings. Life history: To await receptive females, males perch all day in grassy valley bottoms and swales. 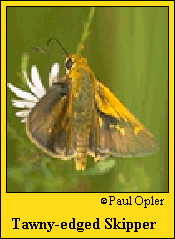 Females lay eggs singly on or near the host plant. Caterpillars feed on leaves and live in shelters of tied leaves. Chrysalids hibernate. Flight: One brood from June-July in the north, two broods from April-September from New York south, several broods throughout the year in Florida. Caterpillar hosts: Panic grasses (Panicum), slender crabgrass (Digitaria filiformis), and bluegrass (Poa pratensis). Adult food: Nectar from flowers including alfalfa, red clover, dogbane, shrub houstonia, purple coneflower, thistles, and chicory. Habitat: Moist grassy areas including prairie swales, pastures, lawns, roadsides, and vacant lots. Range: Southern British Columbia east across southern Canada to Nova Scotia; south to northern California, central Arizona, central Texas, the Gulf states, and central Florida.